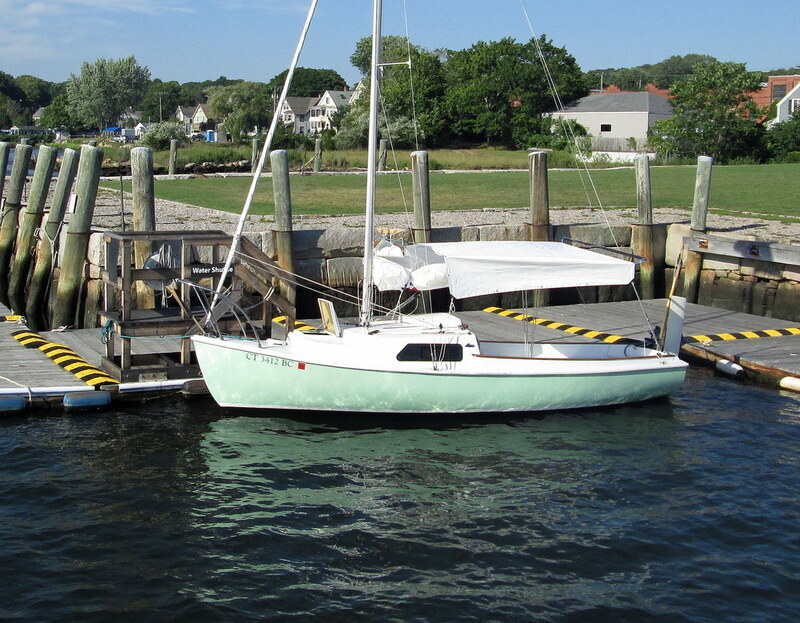 Awning and Cockpit Cover — O'Day Mariner #1922 "Orion"
There’s nothing like finding a sheltered place to anchor for an hour or two and relax on your boat, perhaps to read a book, listen to music or take a nap. But it can be downright hot when the sun is blazing down and there’s no shade, and it’s easy to bake in the cabin, especially if you don’t have a forward hatch to help let the air inside. An awning is an ideal way to be comfortable so you can sit or lie down in the cockpit and enjoy the weather and surroundings without burning to death. On the same token, for those of us who cruise, it can be a most gratifying experience to sleep outside in the cockpit, but here, again, shelter is needed from the dew and perhaps an occasional evening shower. I wanted to make a daytime awning that would serve double-duty as a nighttime cover. I also wanted it to be small, light-weight, easy to modify and, most of all, inexpensive. 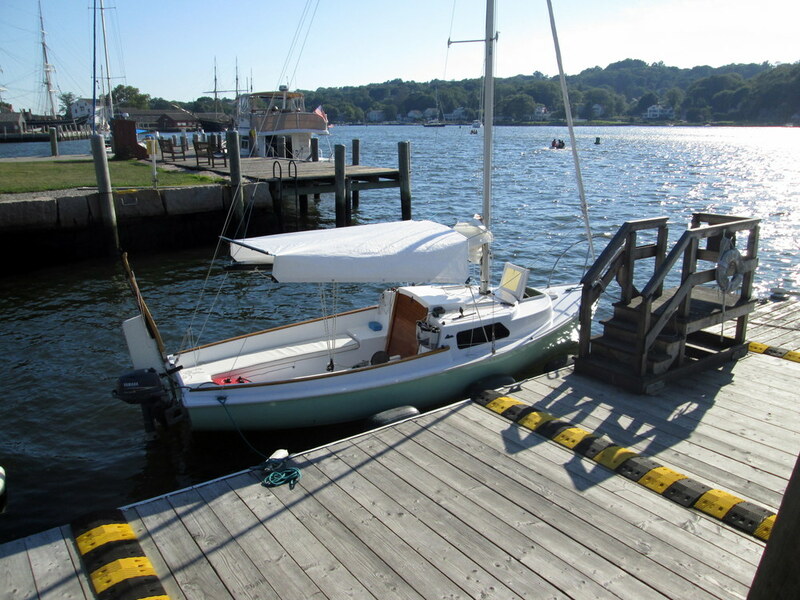 It needed be secure in case of wind gusts, and besides the awning/cover itself, I didn’t want to have to add any more items to the boat. After some experimentation, I have found what I was looking for. While everything comes to about $111 if you start totally from scratch, I already had the whisker pole, line and shock cord with accessories, so I only ended up spending $10 on the tarp and $31 on the grommet kit for a total of $41. The 8-foot length is the perfect size for the boom, and the 8-foot width is a good span for the 7-foot whisker pole and boat hook. My whisker pole has clips on both ends, but others may be configured differently. They may also be shorter or longer than 7-feet, but it’s easy to customize your tarp to fit the materials you have. The first thing I did was to lay my tarp some place flat and center the whisker pole at the edge I determined to be the aft-most edge. 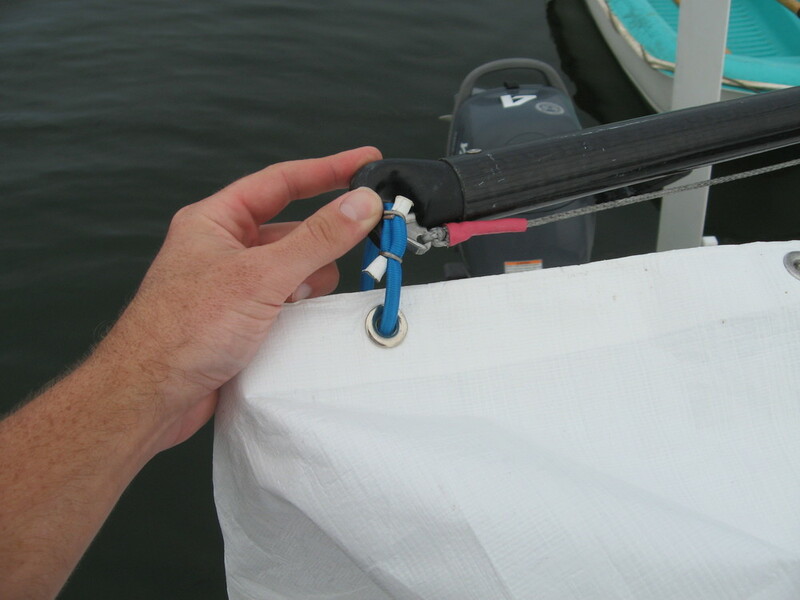 I then punched holes in the tarp and installed grommets about 4” inboard of where each end of the whisker pole lined up. I made small loops of shock cord through those grommets using the c-clamps and clinching ring pliers. These loops are to be connected to the whisker pole ends, and the shock cord loop ends will stretch out the tarp to be taut. After this was done, I made two more grommets at the other edge of the tarp mirroring the ones I had just made. These will be put to use later. Finally, I attached 4-foot lengths of line to each of the four corners of the tarp. These will be used to tie the tarp down to the boat itself. I brought everything to the boat to set it up. 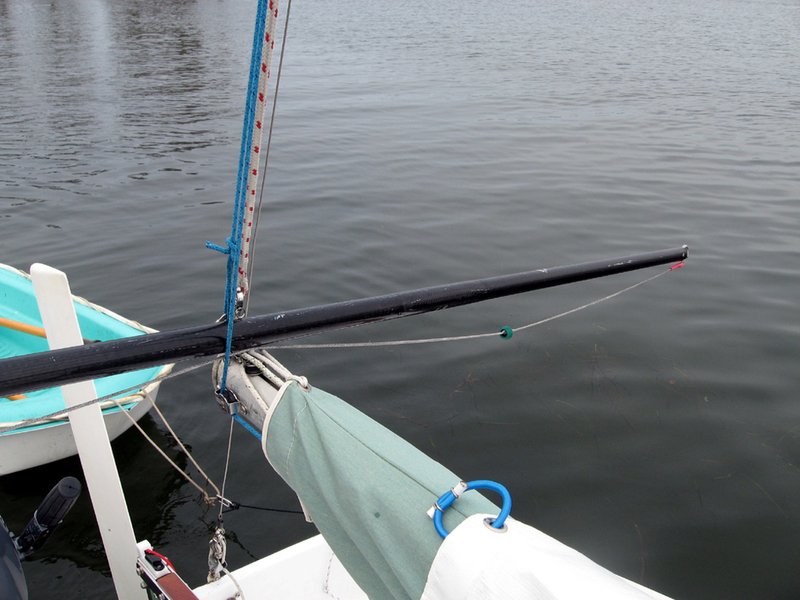 First, I put the whisker pole on the back edge of the boom and connected both ends of the pole into the shock cord loops I had made. I then tied the lines on the aft corners to the aft cleats on the boat. 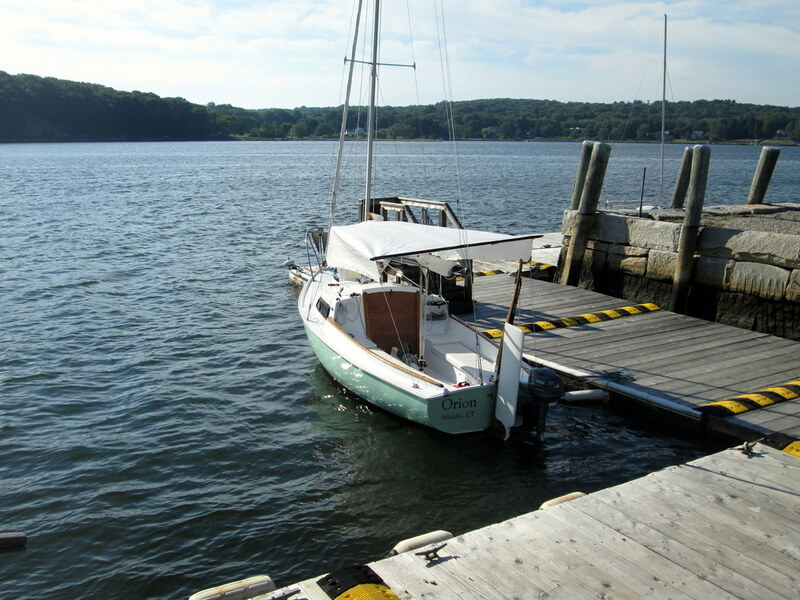 The pole allows most of the tarp to be flat horizontally while allowing a few inches of the tarp on the port and starboard sides to drape down, acting as a nice shield from the sun as it shifts position. The next thing I did was attach shock cord to the two new grommets I had made at the forward edge of the tarp. I looped the shock cord around the shrouds and then back to the next available grommet to pull the tarp taught, attaching clips on the ends to make it easier. This requires a bit of experimenting to get the best length. Fortunately, the friction of the shock cord on the shrouds themselves is enough to keep it in place, even in high winds. I then secured the corners with the light line to the chainplates to keep it taut. After it was fairly secure, I went around adjusting everything again to make sure everything was set correctly. And, voila! A great looking and highly functional awning was created! With more adjustments, it can quickly be converted into a cockpit cover for sleeping overnight. Now, it's not going to cover the whole cockpit - just the forward majority. This is perfect for keeping dew off you when you're sleeping, and it fends off rain showers. Anything more and you would probably want to seek the shelter of the cabin. But you can create variations, such as snugging up the front area but keeping the back open for a better nighttime view of the anchorage. This is a favorite technique of mine, and I frequently employ it, even during rainstorms. While the aft part of the cockpit seats get wet, I'm able to sleep in the cabin and have the entire companionway open for great ventilation. It's your creation - modify it however you like!